House hunting was a serious concern to middle- and upper-class Edwardians. They were not only concerned with expense and location, but sanitation and transportation. The most common method of finding a new home was to drive around suitable neighborhoods and search for “To Let” signs. On these signs were listed the general details of the house and how to contact the house agent. Listings were also placed in newspapers and major journals–or, if one were so inclined, a visit to a top house agency to see their available houses went straight to the heart of the matter. The purchase or leasing of large estates were yet another layer of house hunting, but for now, we shall focus on Edwardian London! For the wealthier class there are West-End firms who undertake the whole business. These firms have always in their hands the letting of a certain number of first-class residences in the localities favoured by rank and fashion. The fashionable house-hunter cannot go very far afield in search of his new address. Society has certain quarters in which it keeps itself “to itself” as much as possible in these days of the millionaire, native and imported; therefore the fashionable house-hunter is confined to one of the aristocratic squares or streets of the West or South-West. These houses are not generally advertised, nor do they display as a rule the notice boards which allow the passer-by to know that they are to be let. They are placed in the hands of a firm whose speciality it is to deal in “town mansions.” The people who desire such a property send to such a firm and request it to find them a residence. The firm indicates the residences on their books, and the rest is merely a matter for the solicitors of the two parties to the transaction. When the purchase or the leasing is completed the world is informed in the “Society” columns of the daily papers that Lord This or Lady That has taken Number So-and-so, Berkeley, or Cavendish, or Portman, or Eaton, or Grosvenor Square, or Park Lane, as the case may be. 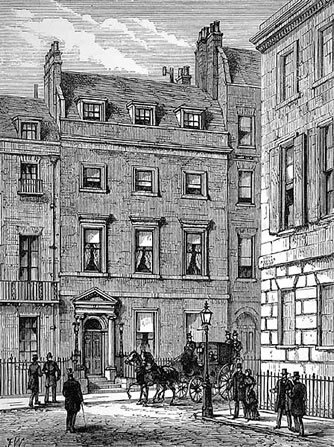 Occasionally photographs are taken of residential properties of the first class and may be seen in the front windows of, let us say, Messrs. E. and H. Lumley, in St. James’s Street. The higher-class house furnishers are also house agents, and have generally on hand a number of photographs, thus enabling their clients to see what a house looks like without the trouble of going to it. If the photograph makes a good impression, personal inspection follows; but in some cases houses, principally furnished houses let for the season or a limited period, are taken for clients abroad who see their new home for the first time when they drive to it from the railway station. But for the great body of house-hunters, the ordinary family folk who have many things to consider before their address is altered in the Post Office Directory, the process of house-hunting is at once more absorbing, more anxious, and more fatiguing. Flats, with all their advantages, do not always retain their charm for Londoners. There is a great difficulty in getting good servants, for Mary Jane looks upon life on the third or fourth floor of a huge block of buildings as too far removed from the world below. In many flats the kitchen and the servants’ rooms look out on back streets or back gardens, and so the servant difficulty forces many a flat family into house-hunting. Then comes the difficulty that the furniture of a flat does not always suit houses which are differently arranged, and generally much more spacious in their room measurement. The flat house-hunter therefore hunts generally for a house which can be fitted and furnished with the flat “belongings,” and makes many anxious inquiries as to rates and taxes, which were covered by the flat rent. The flat people invariably want more garden than anyone else, because they have been without a garden for so long ; and, having had the use of a lift, they look at stairs with a critical eye. To find a house that will satisfy the family moving from a flat is one of the house agents’ most difficult tasks. The small house-hunter is perhaps the most genuine hunter of all. She—it is generally the wife, for the husband is in employment and not his own master—covers ten miles in her search to the better class house-hunter’s one. She has no agent to assist her, and not only is the rent a great consideration, but she must make sure that the ‘bus or train service is convenient for her husband’s daily journeys to and from his place of employment. At last [a]e house is taken, and the references given. The references are a worry to many men who have no banker. It is a delicate thing to write to a friend in a good position and say “Will you be my reference?” As a rule, in small properties the last landlord’s reference is sufficient. But many landlords ask for two. The second reference keeps many an honest man awake of nights just before quarter day. The way in which the population of London drifts and changes, and flits from house to house and from neighbourhood to neighbourhood, is always wonderful, but the most remarkable feature of the “general post” which takes place on the great moving days—Lady Day and Michaelmas Day—is that all the new villa residences springing up in every direction around the Metropolis are snapped up almost before the slates are on them. Hardly are the windows in before a large “Let” is whited on them. The old neighbourhoods are still densely inhabited, the boards after quarter day are few and far between; but in some mysterious way a new population is continually entering the capital, and the stream of house-hunters spreads itself over neighbourhoods that a year previously were green fields and meadows and country lanes. A year later they will have their streets of thriving shops, their pawnbroker and hotel, their local Bon Marche, their telephone call office, and their local newspaper.